We’re here to help you discover the St. John wardrobe that complements you at the St. John Knits Houston boutique. Whether you’re dressing for a charity event or updating your workwear wardrobe, the Houston boutique stylists are dedicated to providing you the highly personal and luxury shopping experience you’d expect from St. John. We also offer a suite of client services including alterations, in-home delivery and tailored style consultation. Please inquire for more information with the store at 713-871-9900. 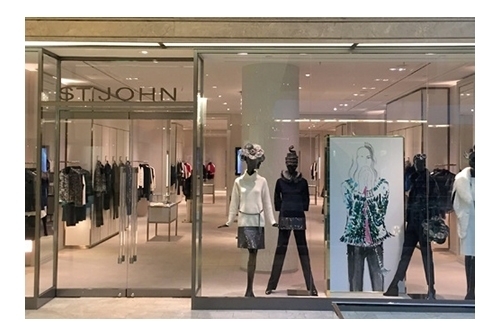 The newly remodeled boutique located in the Saks Fifth Avenue wing at the Houston Galleria features a modern design where local and visiting clients can receive the attentive service and luxury experience St. John is known for. The St. John Houston store is located between two of the most exclusive neighborhoods nearby, River Oaks and Memorial on 5115 Westheimer Road. The level of personal service and impeccable attention to detail from our stylists is matched only by the craftsmanship of our collections including jackets, dresses, gowns, evening, couture, workwear, and casual weekend ready styles. Visit the Houston St. John Knits any day of the week for a welcoming and completely personalized shopping experience. We practice craft and couture. With iconic American design and signature knits, we invite you to experience first-hand, the meticulous details, craftsmanship, and one of a kind embellishments that have become synonymous with St. John Knits. Visit us at the St. John Knits Houston boutique and we will personally guide you through the range of St. John collections to see the effortless, alluring and refined clothing that has appealed to women all over the world since 1962.